Liming Dai joined Case Western Reserve University (CWRU) in fall 2009 as the Kent Hale Smith Professor in the Department of Macromolecular Science and Engineering. He is also director of the Center of Advanced Science and Engineering for Carbon (CASE4Carbon) at CWRU and the BUCT-CWRU International Joint Laboratory. Dr. Dai received a BSc degree from Zhejiang University in 1983, and a PhD from the Australian National University in 1991. He accepted a postdoctoral fellowship from the Cavendish Laboratory at the University of Cambridge, and two years later became a visiting fellow in Department of Materials Science and Engineering at the University of Illinois at Urbana-Champaign. He spent 10 years with the Commonwealth Scientific and Industrial Research Organization (CSIRO) in Melbourne, Australia. Before joining the CWRU, he was an associate professor of polymer engineering at the University of Akron and the Wright Brothers Institute Endowed Chair Professor of Nanomaterials at the University of Dayton. 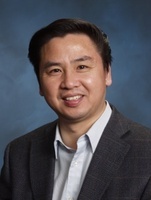 Dr. Dai’s expertise covers the synthesis, functionalization, and device fabrication of conjugated polymers and carbon nanomaterials for energy-related and biomedical applications. He has published more than 450 scientific papers, and held about 30 issued/applied patents. He has an h-index of 128 and citations of 59,183 (Google Scholar). He has also published a research monograph on intelligent macromolecules and 6 edited/co-edited books on carbon nanomaterials for advanced energy systems and biomedical applications. Dr. Dai serves as an Associate Editor of Nano Energy (Elsevier) and editorial board member of many international journals. He is a Highly Cited Researcher (Chemistry, Materials) and has received various awards, including the 2018 NASA-Langley Henry J.E. Reid Award, 2016 CWRU Faculty Distinguished Research Award, 2016 Honorary Fellow Award from Wollongong University (Australia), 2016 Honorary Professorship Award from National Central University (Taiwan), 2014 CWRU CSE Research Award, 2013 Zhejiang Science and Technology Award, 2013 Zhejiang Biomedical Technology Award, 2009 World Class University (WCU) Professor Award (South Korea), 2006 China (NSFC) Outstanding Overseas Young Chinese Scientist Award, 2006 Ohio Outstanding Engineer and Scientist Award, 2006 George Noland Research Award from Sigma Xi, and 2003 IUPAC Young Observer Award. He is a Fellow of the Royal Society of Chemistry and Fellow of the American Institute for Medical and Biological Engineering (AIMBE). Polymers have been traditionally used as electrically insulating materials: after all, metal wires are coated in plastics to insulate them. However, various conjugated macromolecules with alternating single and double bonds have been synthesized with unusual electrical and optical properties through the p-electron delocalization along their 1D backbones. A number of synthetic methods have also been devised to produce conjugated polymers with the processing advantages of plastics and the optoelectronic properties of inorganic semiconductors for energy conversion and storage, including polymer photovoltaic cells. Having conjugated all-carbon structures, carbon nanomaterials, including 1D carbon nanotubes and 2D graphene, also possess certain similar optoelectronic characteristics as conjugated macromolecules. Thus, carbon nanomaterials (e.g., 1D carbon nanotubes, 2D graphene sheets, 3D carbon architectures) have been playing a more and more important role in the development of efficient energy conversion and storage devices. In this talk, I will present some of our rational concepts for the design and development of functional conjugated polymers and multidimensional carbon nanomaterials for various energy-related applications, including polymer solar cells containing graphene nanosheets for improving charge transport, fuel cells and metal-air batteries with carbon nanomaterials as multifunctional metal-free catalysts, and supercapacitors with nanotube/graphene hybrid electrodes for energy storage. 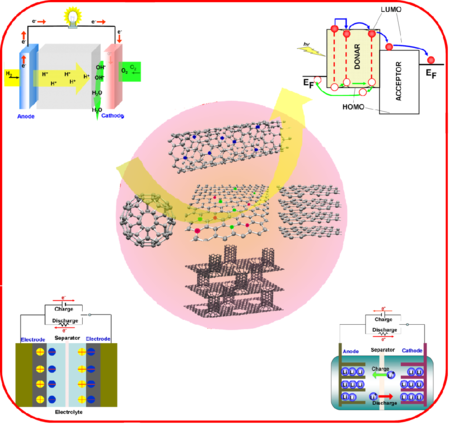 Figure Caption: Multidimentioal polymers and carbon nanomaterials for energy applications.